Once upon a time, there were Three Little Pigs. The pigs lived at home with their mother. One day, she said, "You are too old to live at home any longer. You must find houses of your own." She gave them each a kiss good-bye and reminded them to stay away from the Big Bad Wolf. The pigs walked down the road until they came to man driving a cart filled with straw. "Please sell me your straw," said the First Little Pig. And he did! Straw does not make a strong house, but it was cheap. So, the First Little Pig built a house out of straw and had enough money left over to buy junk food and candy to eat. The Second Little Pig saw a man driving a cart filled with sticks. "Please sell me your sticks," said the Second Little Pig. And he did! Sticks do not make a strong house, but sticks are cheap. So, the Second Little Pig built a house out of sticks and had enough money left over to buy fast food and soda. The Third Little Pig saw a man driving a cart filled with bricks. "Please sell me your bricks," said the Third Little Pig. And he did! Bricks make very strong houses, but bricks are expensive. So the Third Little Pig spent all his money to build a house out of bricks and had to hunt for food outdoors to eat. He found wild roots and onions and mushrooms and ate very healthy. Suddenly the Big Bad Wolf came to the door of the First Little Pig. He knocked at the door, and said, "Little pig, little pig, let me in. Let me in!" The pig answered, "No! Not, by the hair on my chinny chin chin." The Wolf said, "Little Pig, if you don't let me in, I'll huff, and I'll puff, and I'll blow your house down." Then he huffed, and he puffed, and he blew the house down. The Little Pig ran as fast as they could to his brother's house. As sooner as the door closed behind him, along came the Big Bad Wolf. The Wolf knocked at the door and said, "Little pigs, little pigs, let me in. Let me in!" Both pigs answered "No! Not by the hair on our chinny chin chins." The Wolf said, “Little Pigs, if you don't let me in I'll puff, and I'll huff, and I'll blow your house down." Then he huffed, and he puffed, and he puffed, and he huffed, and he blew the house down. Both Pigs ran as fast as they could run to their brother's house. No sooner than the door had closed behind them at the Third Little Pig's house, when along came the Big Bad Wolf. He knocked on the door and said, "Little Pigs, Little Pigs, let me in. Let me in!" All three Pigs answered, "No! Not by the hair on our chinny chin chins." The Wolf said, "If you don't let me in I'll huff, and I'll puff and I'll blow your house down." Then he huffed, and he puffed, and he huffed and he puffed. But he could not blow the house down. Then the wolf pretended to be nice. He said, "Little pigs, I know where there is a nice field of turnips." "Where?" said the Three Little Pigs. "Oh, on the other side of the hill. I will come over tomorrow, and we can go there together." "Very well," said the Pigs, "We will be ready. What time will you be here?" The Big Bad Wolf said six o'clock, but the Three Little Pigs got up at five, and got the turnips before the wolf came. 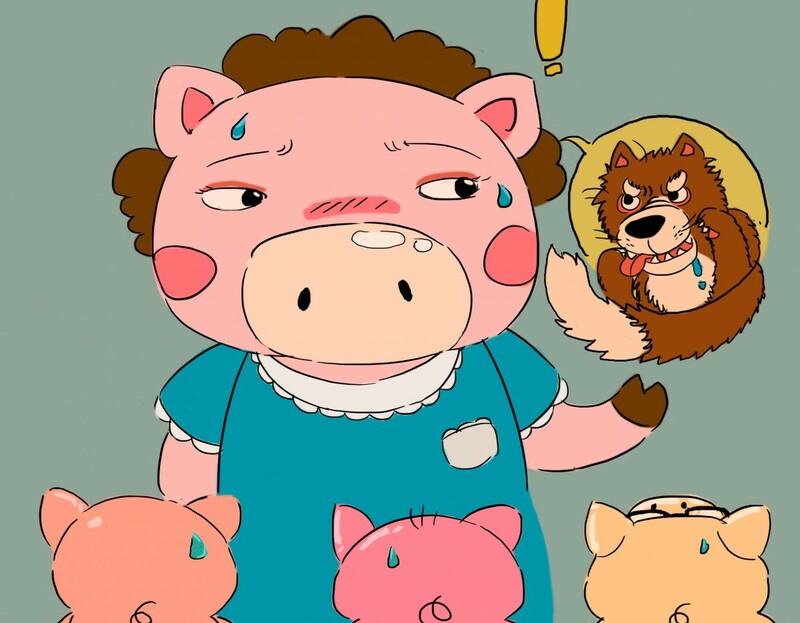 The Big Bad Wolf said, "Little Pigs, I am here to pick turnips with you." The Three Little Pigs said, "We have gone and are back and are fixing them for dinner." The Wolf was very angry. He wanted to eat up those Three Pigs. He climbed up the side of their house and onto their roof. He was going to climb down the chimney. The Three Little Pigs heard him on the rook and hung a pot filled with boiling water under the chimney. Just as the Wolf was coming down, the Pigs took off the cover. The Wolf landed in the hot water. He howled and went right back up the chimney. The Wolf howled all the way down the road and can still be heard howling today. The Three Little Pigs lived happily ever after. Adapted from: Joseph Jacobs, English Fairy Tales (London: David Nutt, 1898), no. 14, pp. 68-72. Jacobs' source: James Orchard Halliwell, Nursery Rhymes and Nursery Tales (London, ca. 1843).